The unique Australian approach of creating quantum bits from precisely positioned individual atoms in silicon is reaping major rewards, with UNSW Sydney-led scientists showing for the first time that they can make two of these atom qubits "talk" to each other. The team – led by UNSW Professor Michelle Simmons, Director of the Centre of Excellence for Quantum Computation and Communication Technology, or CQC2T – is the only group in the world that has the ability to see the exact position of their qubits in the solid state. Simmons' team creates the atom qubits by precisely positioning and encapsulating individual phosphorus atoms within a silicon chip. Information is stored on the quantum spin of a single phosphorus electron. The team's latest advance – the first observation of controllable interactions between two of these qubits – is published in the journal Nature Communications. It follows two other recent breakthroughs using this unique approach to building a quantum computer. By optimising their nano-manufacturing process, Simmons' team has also recently created quantum circuitry with the lowest recorded electrical noise of any semiconductor device. And they have created an electron spin qubit with the longest lifetime ever reported in a nano-electric device – 30 seconds. "The combined results from these three research papers confirm the extremely promising prospects for building multi-qubit systems using our atom qubits," says Simmons. Simmons, who was named 2018 Australian of the Year in January for her pioneering quantum computing research, says her team's ground-breaking work is inspired by the late physicist Richard Feynman. "Feynman said: 'What I cannot create, I do not understand'. We are enacting that strategy systematically, from the ground up, atom by atom," says Simmons. "In placing our phosphorus atoms in the silicon to make a qubit, we have demonstrated that we can use a scanning probe to directly measure the atom's wave function, which tells us its exact physical location in the chip. We are the only group in the world who can actually see where our qubits are. "Our competitive advantage is that we can put our high-quality qubit where we want it in the chip, see what we've made, and then measure how it behaves. We can add another qubit nearby and see how the two wave functions interact. And then we can start to generate replicas of the devices we have created," she says. For the new study, the team placed two qubits – one made of two phosphorus atoms and one made of a single phosphorus atom – 16 nanometres apart in a silicon chip. "Using electrodes that were patterned onto the chip with similar precision techniques, we were able to control the interactions between these two neighbouring qubits, so the quantum spins of their electrons became correlated," says study lead co-author, Dr Matthew Broome, formerly of UNSW and now at the University of Copenhagen. "It was fascinating to watch. When the spin of one electron is pointing up, the other points down, and vice versa. "This is a major milestone for the technology. These type of spin correlations are the precursor to the entangled states that are necessary for a quantum computer to function and carry out complex calculations," he says. 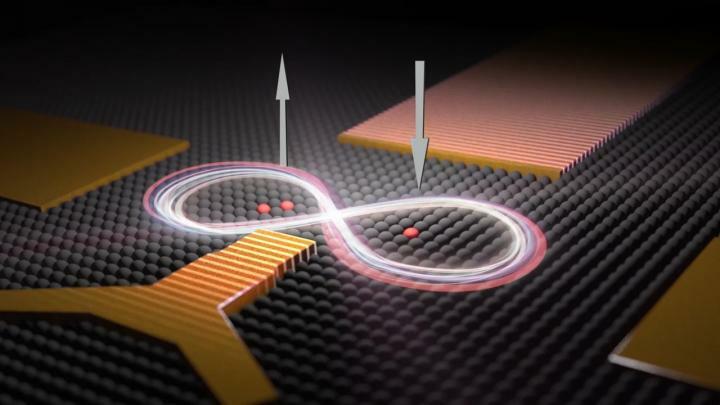 Study lead co-author, UNSW's Sam Gorman, says: "Theory had predicted the two qubits would need to be placed 20 nanometres apart to see this correlation effect. But we found it occurs at only 16 nanometres apart. "In our quantum world, this is a very big difference," he says. "It is also brilliant, as an experimentalist, to be challenging the theory." UNSW scientists and engineers at CQC2T are leading the world in the race to build a quantum computer in silicon. They are developing parallel patented approaches using single atom and quantum dot qubits. "Our hope is that both approaches will work well. That would be terrific for Australia," says Simmons. The UNSW team have chosen to work in silicon because it is among the most stable and easily manufactured environments in which to host qubits, and its long history of use in the conventional computer industry means there is a vast body of knowledge about this material. In 2012, Simmons' team, who use scanning tunnelling microscopes to position the individual phosphorus atoms in silicon and then molecular beam epitaxy to encapsulate them, created the world's narrowest conducting wires, just four phosphorus atoms across and one atom high. In a recent paper published in the journal Nano Letters, they used similar atomic scale control techniques to produce circuitry about 2-10 nanometres wide and showed it had the lowest recorded electrical noise of any semiconductor circuitry. This work was undertaken jointly with Saquib Shamim and Arindam Ghosh of the Indian Institute of Science. "It's widely accepted that electrical noise from the circuitry that controls the qubits will be a critical factor in limiting their performance," says Simmons. "Our results confirm that silicon is an optimal choice, because its use avoids the problem most other devices face of having a mix of different materials, including dielectrics and surface metals, that can be the source of, and amplify, electrical noise. "With our precision approach we've achieved what we believe is the lowest electrical noise level possible for an electronic nano-device in silicon – three orders of magnitude lower than even using carbon nanotubes," she says. In another recent paper in Science Advances, Simmons' team showed their precision qubits in silicon could be engineered so the electron spin had a record lifetime of 30 seconds – up to 16 times longer than previously reported. The first author, Dr Thomas Watson, was at UNSW undertaking his PhD and is now at Delft University of Technology. "This is a hot topic of research," says Simmons. "The lifetime of the electron spin – before it starts to decay, for example, from spin up to spin down – is vital. The longer the lifetime, the longer we can store information in its quantum state." In the same paper, they showed that these long lifetimes allowed them to read out the electron spins of two qubits in sequence with an accuracy of 99.8 percent for each, which is the level required for practical error correction in a quantum processor. Instead of performing calculations one after another, like a conventional computer, a quantum computer would work in parallel and be able to look at all the possible outcomes at the same time. It would be able to solve problems in minutes that would otherwise take thousands of years. Last year, Australia's first quantum computing company – backed by a unique consortium of governments, industry and universities – was established to commercialise CQC2T's world-leading research. Operating out of new laboratories at UNSW, Silicon Quantum Computing Pty Ltd has the target of producing a 10-qubit demonstration device in silicon by 2022, as the forerunner to a silicon-based quantum computer. The Australian government has invested $26 million in the $83 million venture through its National Innovation and Science Agenda, with an additional $25 million coming from UNSW, $14 million from the Commonwealth Bank of Australia, $10 million from Telstra and $8.7 million from the NSW Government. It is estimated that industries comprising approximately 40% of Australia's current economy could be significantly impacted by quantum computing. Possible applications include software design, machine learning, scheduling and logistical planning, financial analysis, stock market modelling, software and hardware verification, climate modelling, rapid drug design and testing, and early disease detection and prevention.